زعفران از با ارزش‌ترین محصولات دارویی استان‌های خراسان­رضوی و جنوبی است که در تمام مراحل برداشت، انتقال و انبارداری ممکن است به گونه‌های مختلف قارچ Aspergillus آلوده گردد. یکی از توکسین­های ناشی از این آلودگی، آفلاتوکسینB1 است. این پژوهش با هدف بررسی تولید این توکسین توسط قارچ Aspergillus flavus در مراحل مختلف برداشت، انتقال و انبارداری زعفران صورت گرفت. بافت‌های خشک و مرطوب زعفران و بافت‌های برنج آغشته شده به عصاره زعفران، با A. flavusتلقیح گردیده و تولید آفلاتوکسین در آن‌ها به روش کروماتوگرافی TLC بررسی گردید. قارچ آسپرژیلوس توانست در شرایط مختلف این پژوهش، تمام بافت‌های تلقیح شده را آلوده نماید. مقادیر مختلف آفلاتوکسینB1 در تیمارهای مختلف به‌ استثنای زعفران‌های نگه‌داری شده در شرایط خشک (شاهد)، تولید گردید. در بافت‌های برنج آغشته به عصاره زعفران نیز آفلاتوکسین B1تولید گردید ولی میزان آن نسبت به تیمار برنج بدون زعفران، کمتر بود. بر اساس نتایج این پژوهش، بافت‌های زعفران به‌سرعت در شرایط گرم و مرطوب به گونه‌های مختلف آسپرژیلوس آلوده می‌گردند. زعفران خشک و مرطوب تلقیح شده با قارچ آسپرژیلوس، پس از مدتی حاوی مقدار زیادی آفلاتوکسین بود. میزان آفلاتوکسین تولیدی در بافت‌های زعفران، ارتباط مستقیم با رطوبت محیط و بافت داشت. با افزایش رطوبت، آلودگی بافت به قارچ بیشتر و تولید توکسین نیز افزایش یافت. آغشته کردن موادغذایی به زعفران هرچند میزان تولید آفلاتوکسین B1 را کاهش داد ولی تولید آن را متوقف نکرد. نتایج این پژوهش نشان داد که بسته‌بندی زعفران قبل از خشک شدن کامل بافت یا نگه‌داری آن‌ها در شرایط رطوبت بالا، خطر آلودگی به قارچ A. flavus و تولید آفلاتوکسین در آن‌ها را افزایش می‌دهد. Saffron is the most important medicinal plants in the Khorasan Razavi and South Khorasan provinces, Iran. Aspergillus species can infect saffron tissues during harvesting, storage and transportation. Aflatoxin B1 is one of the important carcinogenic mycotoxin which is produced by Aspergillus species in saffron tissues. This study was carried out in order to investigate the production of aflatoxin B1 in saffron tissues from farm to food by TLC chromatography during the year 2015. Wet and dry saffron tissues and rice grains (with and without saffron extract) were inoculated with Aspergillus flavus spore suspensions. Production of Aflatoxin B1 in inoculated tissues was investigated by the TLC chromatography method. The results showed that the wet leaves and rice grains were infected with Aspergillus species very quickly. However, this process was very slow in dry tissues. Aflatoxin B1 was detected in all of the tested samples. The amounts of Aflatoxin B1 in the wet saffron tissues and rice grains were more than those found in dry tissues and saffron rice, respectively. The amount of Aflatoxin B1 had a direct correlation with moisture in the environment and the tissues. The contamination of the tissues and production of AflatoxinB1 were increased with increasing the amount of moisture. The results showed that the packaging of saffron before complete drying of its tissue or storing it in conditions with high humidity can increase the risk of infection with the Aspergillus species and production of Aflatoxin B1 in them. Based on our data, saffron can reduce Aspergillus infection and aflatoxin B1 production but not inhibit it. Saffron extract reduces Aspergillus infection and Aflatoxin B1 production in food and grains. Azzoune, N., Mokrane, S., Riba, A., Bouras, N., Verheecke, C., Sabaou, N., and Mathieu, F. 2016. Contamination of common spices by aflatoxigenic fungi and aflatoxin B1 in Algeria. Quality Assurance and Safety of Crops and Foods 8: 1-8. Bayman, P., and Cotty, P.J. 1991. Vegetative compatibility and genetic diversity in the Aspergillus flavus population of a single field. Canadian Journal of Botany 69: 1707-1711. 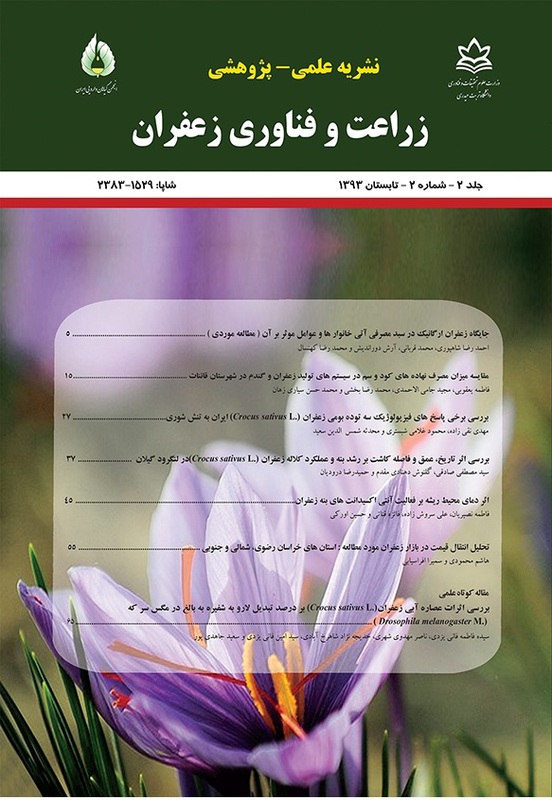 Beheshti, H.R., Sadat Fakoor Janati, S., Feizy, J., and Asadi, M. 2014. Aflatoxin determination in saffron by high-performance liquid chromatography and immunoaffinity column clean-up. Saffron Agronomy and Technology 1: 102-111. Davis, N.D., Diener, U.L., and Eldridge, D.W. 1966. Production of aflatoxins B1 and G1 by Aspergillus flavus in a semisynthetic medium. Applied Microbiology 14: 378-380. Di Primo, P., Cappelli, C., and Katan, T. 2002. Vegetative compatibility grouping of Fusarium oxysporum f. sp. gladioli from saffron. European journal of plant pathology 108: 869-875. Ellis, W., Smith, J., Simpson, B., Oldham, J., and Scott, P.M. 1991. Aflatoxins in food: occurrence, biosynthesis, effects on organisms, detection, and methods of control. Critical Reviews in Food Science and Nutrition 30: 403-439. Galvano, F., Galofaro, V., and Galvano, G. 1996. Occurrence and stability of aflatoxin M1 in milk and milk products: a worldwide review. Journal of Food Protection 59: 1079-1090. Gock, M.A., Hocking, A.D., Pitt, J.I., and Poulos, P.G. 2003. Influence of temperature, water activity and pH on growth of somexerophilic fungi. International Journal of Food Microbiology 81: 11-19. Hacibekiroglu, I., and Kolak, U. 2013. Aflatoxins in various food from Istanbul, Turkey. Food Addit Contam Part B Surveill 6: 260-264. Hesseltine, C.W., Shotwell, O.L., Ellis, J.J., and Stubblefield, R.D. 1966. Aflatoxin formation by Aspergillus flavus. Bacteriological Reviews 30: 795-805. Humans, I.W.G.o.t.E.o.C.R.t., Organization, W.H., and Cancer, I.A.f.R.o. 2002. Some traditional herbal medicines, some mycotoxins, naphthalene andstyrene. World Health Organization. Júnior, D.P.L., Yamamoto, A.C.A., de Souza Amadio, J.V.R., Martins, E.R., do Santos, F.A.L., Simoes, S.d.A.A., and Hahn, R.C. 2012. Trichocomaceae: biodiversity of Aspergillus spp and Penicillium spp residing in libraries. The Journal of Infection in Developing Countries 6: 734-743. Kafi, M., Koocheki, A., and Rashed, M.H. 2006. Saffron (Crocus sativus): Production and Processing. Science Publishers. Martins, M.L., Martins, H.M., and Bernardo, F. 2001. Aflatoxins in spices marketed in Portugal. Food Addit Contam 18: 315-319. Noorbakhsh, R., Bahrami, A.R., Mortazavi, S.A., Forghani, B., and Bahreini, M. 2009. PCR-based identification of aflatoxigenic fungi associated with Iranian saffron. Food Science and Biotechnology 18: 1038-1041. Pawar, V., and Thaker, V. 2006. In vitro efficacy of 75 essential oils against Aspergillus niger. Mycoses 49: 316-323. Richard, J.L. 2007. Some major mycotoxins and their mycotoxicoses—An overview. International Journal of Food Microbiology 119: 3-10. Saeedizadeh, A. 2014. Identification of some saffron corm rot fungi and their control. Saffron Agronomy and Technology 2: 205-213. Scott, P.M., and Trucksess, M.W. 1996. Application of immunoaffinity columns to mycotoxin analysis. Journal of AOAC International 80: 941-949. Shotwell, O.L., Hesseltine, C., Stubblefield, R., and Sorenson, W. 1966. Production of aflatoxin on rice. Applied Microbiology 14: 425-428. Sinclair, J.B., and Dhingra, O.D. 1995. Basic plant pathology methods. CRC press. Vahidi, H., Kamalinejad, M., and Sedaghati, N. 2002. Antimicrobial properties of Croccus sativus L. Iranian Journal of Pharmaceutical Research 1: 33-35. Vinnere Pettersson, O., and Leong, S.l.L. 2011. Fungal Xerophiles (Osmophiles). eLS.